/ What Is The Use Of Standard Deviation In PERT Estimation? What Is The Use Of Standard Deviation In PERT Estimation? What is the chance of getting a ‘Heads’ in a toss of a coin? You would say that’s easy. There is a 50% chance of getting a Heads. Or you would say Probability of getting ‘Heads’ is 50% or 1/2. What is the chance of getting a ‘Six’ in a throw of a dice? You would think a bit more and then say there is a 1 in 6 chance of getting a ‘Six’. Or you would say Probability of getting ‘Six’ is 16.67% or 1/6. Those were easy questions. How would you respond to the following question? What is the Probability completing a Task T in X days? Let us try to answer this question. I had written an article on 3-Point Estimation. In that article, I described the significance of 3-Point Estimation. I also described the two ways of doing 3-Point Estimation – Triangular Distribution and Beta Distribution. 3-Point Estimation formulas can be used to determine Mean (Expected Value) of 3 numbers – Optimistic Value, Most Likely Value and Pessimistic Value. Triangular Distribution method uses Simple Average of 3 values to determine Mean. BEta Distribution method uses PERT Formula to determine Mean. In Statistics Mean and Standard Deviation have special significance. The Mean is calculated on a series of numbers and can be referred as “Central Value” of these numbers. The Mean can be determined by finding either the Simple Average or the Weighted Average of a series of numbers. We discussed in the previous article that PERT formula calculates the Weighted Average. PERT Formula a close approximation for determining Mean for Beta Distribution. In Statistics and Probability Theory, Standard Deviation is usually represented by the symbol of Sigma, σ. Standard Deviation shows the Variation from the Mean. A low Standard Deviation indicates that the observations (series of numbers) are very close to the Mean. A high standard deviation indicates that the observations (series of numbers) are spread out over a large range. We will use PERT formulas in this article. But use of Standard Deviation is equally applicable to Triangular Distribution. Let us look at the example from my previous article on 3-Point Estimation – how much time would be required to go from point A to point B. Let us use PERT formula for calculating the Mean. It means there is a fair chance (Central Value) of completing the task (going from point A to point B) in 105 minutes. Let us calculate Standard Deviation for our example. So there is a 30 minutes of Variation from the Mean. Let us understand what is meant by Variation from the Mean. Let us go back to our example – how much time would be required to go from point A to point B. Let us assume we have already made ‘n’ trips from point A to point B. We have also measured and recorded the Duration for each trip. The Duration is likely to be different for each trip. However, each Observation (Duration of the trip) is likely to be between Optimistic value and Pessimistic value. Maximum number of Observations would be near to the Mean but there would be a few Observations that are near Optimistic or Pessimistic values. Or we say that Population Density would be higher near the Mean and it will taper off towards Optimistic and Pessimistic values. We can plot a graph for these ‘n’ Observation. The Population Density of these Observations would look like a Bell Curve. 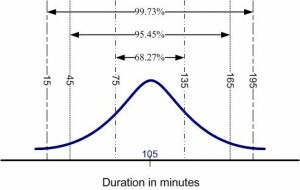 Bell Curve for our example is shown in following figure. The X-axis shows Duration in minutes and the Y-axis shows Population Density. We can depict Population Density as “number of trips” or “percentage of trips”. The following figure shows percentage of trips. The adjoining figure depicts a Normal Distribution curve. Normal Distribution is a special case of Beta Distribution. Beta Distribution is skewed to one side. Although Beta Distribution is slightly skewed to one side, Normal Distribution provides a decent proxy for Beta Distribution. You would notice that Population Density is highest near the Mean. It means that there is a greater chance of making a trip in approximately 105 minutes. Let us now answer our original question – What is the Probability of completing a Task T in X days? This is where “Use of Standard Deviation” comes in. Following discussion assumes data points are Normally Distributed. 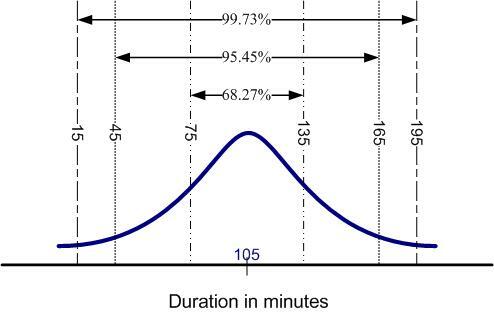 Use of Standard Deviation – Instead of giving a Single Estimate we can say that Duration Estimate is 105±30 minutes. Or we can say that it is likely to take anywhere between 75 minutes to 135 minutes to go from point A to point B. Essentially, we are increasing our chances for finishing the trip in promised Duration. Secondly, we can determine what is the probability of completing the trip within 105±30 minutes. There is a 68.27% Probability of completing the trip within 105±30 minutes. Let us answer why did we take the probability as 68.27%. The Range R is dependent on ‘n’. Value of ‘n’ is usually chosen by the Project Team. Essentially, it means that Project Team will choose a Range for which it feels confident. Project Team would choose a σ level for which it is more or less sure of completing a task. Using the Probability Distribution theory, we can determine the Probability associated with a Range. This Probability is also called the Confidence Level. Following list provides Probability for different values of ‘n’. Many people believe Probability and Standard Deviation is just a good Mathematical Stuff. There is hardly any use of it in the real world. This is not true. Standard Deviation is very useful in practical scenarios. You should read my article – A project is scheduled to FAIL. What are your thoughts on this topic? 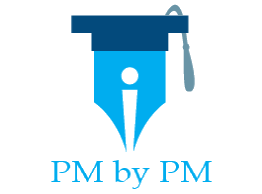 Do you think you will be able to solve PMP questions after reading this article? Would you try to implement this concept in your project schedule? How To Use PERT, CPM & Standard Deviation Together? Thanks, this article was really helpful. Very well written and clear. Thanks for sharing. This was a good explanation of how to apply the statistical concepts to PM area, thank you. Great Article – thank you very much for posting it! I had a discussion with a statistician about this formula sigma = (P -O)/6. He said that was not recognized way to calculate standard deviation from the mean. I would believe that to be true for small data sets, even with a normal distribution assumption. I understand that this formula is very helpful to bracket a duration of a task, and thereby assist with giving the PM a red flag to sound the alarm in a project, but is this a standard statistical method or a practical formula for calculating a range? What research/proof do I share with statisticians about the validity of this formula?